On the top floor of the Emporium shopping center, next to the Phrom Phong BTS Skytrain station, is the Thailand Creative and Design Center. TCDC was formed in 2003 and is a 4000 square meter (40,000+ square feet) design knowledge hub offering an extensive design library, materials and multimedia resource center, exhibition galleries, workshops, and lectures. It is a pretty nifty thing to have and it is well-used by our creative professionals and university students. Tawn has been using it to do some of his fashion design studies, in fact. TCDC is also home to a cute cafe, Kiosk, owned by friends of ours. 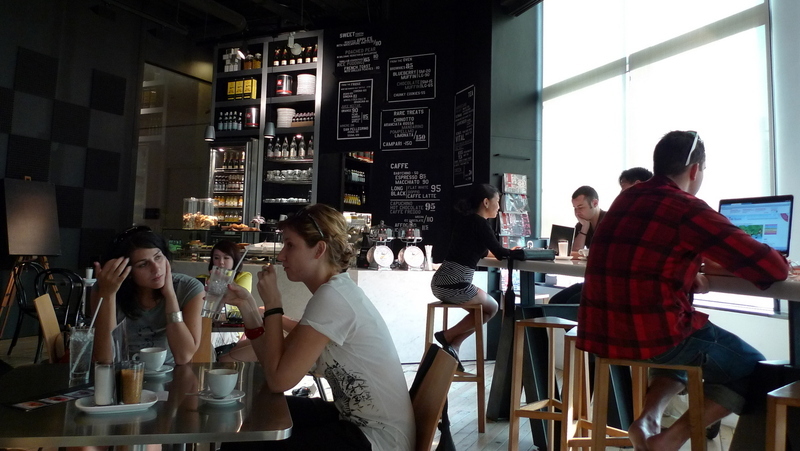 It has good drinks and food, a place for live music, and a nice atmosphere in which to hang out. Not a plug for them, just explaining where Tawn and I were for an hour or so last weekend. While we enjoyed our snacks and coffee, Alfred Hitchcock’s classic 1958 film Vertigo played silently on a screen in the background with English subtitles. We engaged another customer, a Thai man in his 50s, in conversation as he used to live in the US as was trying to figure out which of film it was. It was nice to see scenes of my native San Francisco, albeit from a dozen years before I was born. In other news, I am picking up some guests this morning who are arriving from Singapore. When I went to view their flight status on Singapore Airlines’ website, I was amazed to see that SQ considers themselves delayed even one minute after schedule. Don’t most airlines give themselves a 15-minute window? This entry was posted in Uncategorized and tagged cafe, Design, Hitchcock, Kiosk, TCDC, Vertigo by christao408. Bookmark the permalink. Hitchcock and muffins … what a fabulous pairing! The best airline I have had the pleasure of flying, is Singapore Airlines. Impeccable service, fantastic seating and great food. 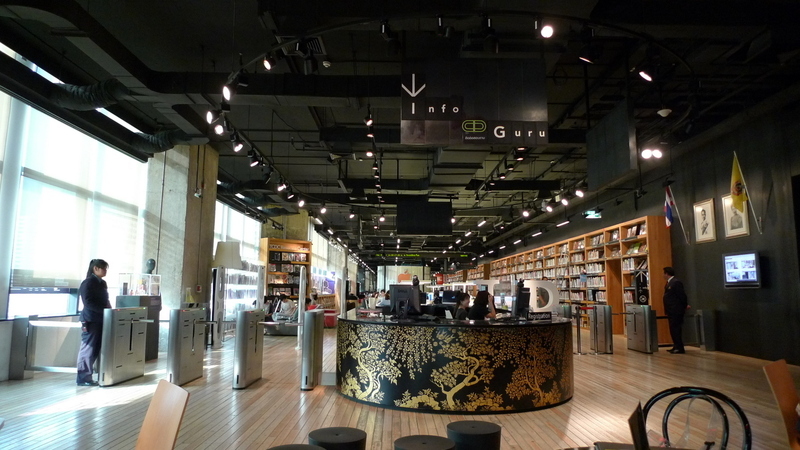 Their lounge in Singapore, is truly one of the best. Oh, I like the Emporium! Is Greyhound cafe still in business? I’d like to try the chocolate muffin, looks yummy! Hitchcock – love his movies. 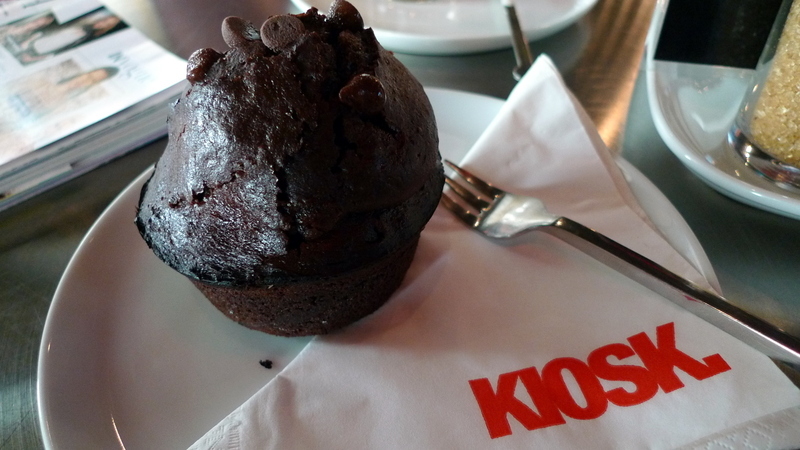 And of course, anything chocolate – muffins yummy!!! TCDC looks fantastic- I wish Delhi had a similar space. Looks like a nice place. Good coffee? @Dezinerdreams – Truthfully, TCDC is one of those “I can’t believe it happened here” sort of places. Even though it was started under the Thaksin government, which was overthrown by the coup, it has been allowed to continue as part of the current government’s “Creative Thailand” economic initiative. Delhi would be a great place for something similar. Maybe you need to drive it! @murisopsis – Oh, I miss pears. We have good Asian pears but the western ones are imported, expensive, and mealy. Bleh. @yang1815 – Natch. 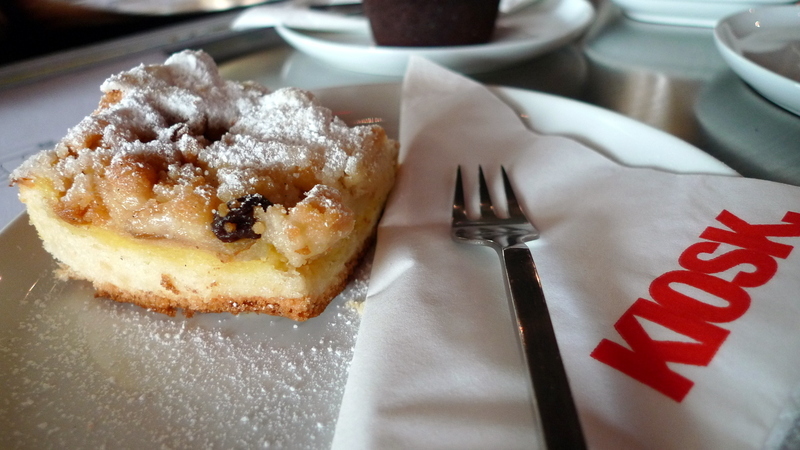 Illy Caffe. i feel like most airlines will only admit that they’re going to be delayed if it’s like 45+ min hahai could use an apple strudel right now. with lots and lots of crumbles. Felix and I were making our way through all the Hitchcock movies but I don’t think we made it to Vertigo. Is it good? @iskrak – The irony was, by the time I arrived at the airport to pick up my guests, the flight had touched down ten minutes early. 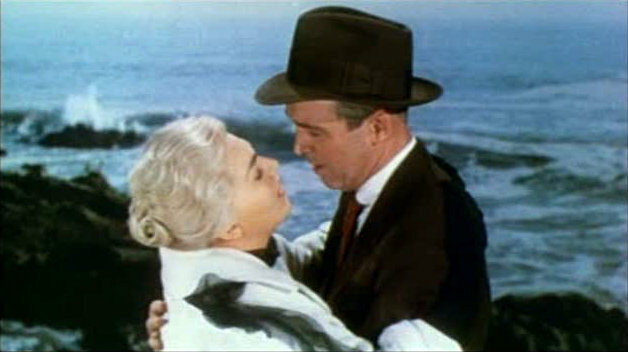 @brooklyn2028 – Vertigo is very good. Truly a classic, if for no other reason that to watch how people dressed and SF looked back in those days.